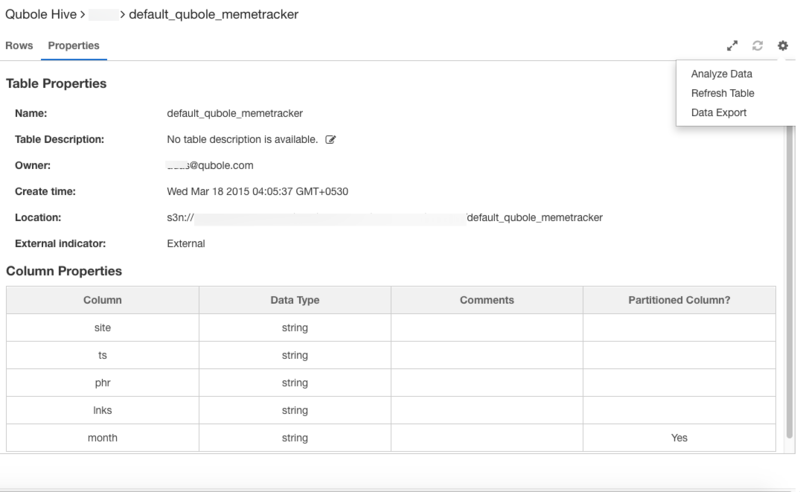 You can export data and create Hive tables from existing data in the Cloud. The data files are stored in folders in Cloud storage. You can upload and download files to and from these folders in Cloud storage. You configure the storage location from the Account Settings page under Control Panel in the QDS UI. See Managing Account Settings for more information. Select a file to see sample data. By default, Properties of the file are displayed. Click the Sample Data tab to see the data in text/JSON format. You can pin/upin the custom Cloud path by clicking the pin icon available at the end of the S3 bucket location. The following figure provides an example of Sample Data and Properties of a file in AWS S3. For Azure Blob, the corresponding URI would be wasb://default-datasets@paidqubole.blob.core.windows.net/. By default, the data formatted in Text is displayed in the Sample Data tab. Select JSON from the drop-down list to see data in the JSON format. Click Raw Data to see the unformatted text. Select Skip Header Row and Use As Column Names to set the first row as the column names. It is useful if the parent table contained first row as the header row and the new table contains the system-defined column names such as Col 1 and Col 2. See Exporting Data from Cloud Tables and Creating a Schema from Data in Cloud Storage for more information.